Mum’s mum, Nanna S. kept two letters written to her by my mother in an era when married and moved less than 40 kilometres away to live with your new husband’s family you wrote home. Nanna had her own reasons for saving these letters for me, but what I read in the lines of my mother’s handwriting were words describing as a toddler how much I loved my Dad. Dad had his 70th birthday last week. I called him late morning to allow him time to indulge in the sleep-in I knew he’d have. “You made it” I greeted him. He responded with “I got up for my usual quarter to four a piddle and wondered what day it was, and realised that… I made it”. He knows better than anyone else no bookie would have given him odds on a 70th birthday celebration. The day after his birthday, despite unseasonably cold wet weather every family member who could, drove hundreds of kilometres to turn out for the celebration of this milestone in our family history. My grandfather, Pa, born in 1913 died at 61, and my grandmother died a couple of years before him age 50. Dad, the eldest son, surpassed this and leads the way. His two brothers only a few years behind, the cheeky buggers never let him forget, chipping at him with comments such as “what’s it like being old?” Dad bides his time until posing for a youngest–eldest photo he casually comments to his brother in regard to 4 month old Ethan “your grandson’s got more hair than you”. No matter his age, Dad’s still got more hair than his brothers, very little grey and no mercy in playing his trump card. My aunt, the only sister and youngest, responds to Dad’s assurances that he’s now obedient and doing what he’s told, with “It’s about bloody time, you’re old enough”. To which I can only remind her, “It’s words, just words. He does what he wants.” Much as the siblings are alike, Dad never took to conforming. This could account for Dad’s birthday being a day I greeted happily but on which I also shed a few private tears… for the there were many times I thought he wouldn’t make 50. Dad’s 2 main astrological aspects also provide further insight. He is sun sign Aquarian“… Lots of people like rainbows. Children makes wishes on them, artists paint them, dreamers chase them, but the Aquarian is ahead of everybody. He lives on one… you’ll have to be constantly prepared for the unexpected with Uranians. Generally kindly and tranquil by nature, Aquarians nevertheless enjoy defying public opinion, and they secretly delight in shocking more conventional people with occasional erratic conduct…” (Sun Signs – Linda Goodman) and moon sign Sagittarian “… Independent; philosophical mind; gregarious; adventurous; rebellious; humanitarian; intellectual; inspirational; social concerns; urge for expansion; verbose; big-hearted; tactless; confident; good teacher; optimistic; zany humour…” (Sun Sign, Moon Sign – Charles & Suzy Harvey). My sun and moon signs fall the opposite. Coming up to age 23 when I was born he was a typical father of the Sixties. He worked as a motor mechanic, went to the pub, played sport and Mum & I tagged along. At almost age 40 when my first half-sister was born, he became a typical father also of the Eighties, starting a second family as I approached adult life. Mostly, Dad never fully acclimatised to modern father. I’m not sure if he attended the births of my three half siblings but at least with them [I believe] he attended the hospital rather than waiting at home for news, as he did for me in 1965. As they grew up, he didn’t like grungy hair, grungy clothes or loud grungy music. Dad continued as much as possible with Sixties style parenting but also did what he does best, coaching and running around to kids’ sport, following his own philosophy “the family that plays together stays together”… He grumbled a lot but predominantly ignored anything that didn’t fit with his view of the world. The kids are now wonderful adults some of whom will soon be on the cusp of starting families of their own. For his birthday the G.O. and I gave Dad tickets to a show & dinner next month for him, my stepmother and us. After we’ll stay the night at their house and spend some time. However, I couldn’t allow Dad’s 70th birthday to pass without making him a little gift from me. 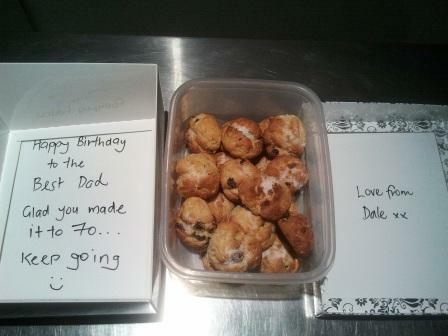 I baked & assembled in an ordinary plastic container his favourite Rock Cakes, and dressed them up in a fancy box. Receiving the unexpected gift, he looked at me questioningly “what’s this?” opened it & peeled back the blue tissue paper, laughed, looked around and said “Don’t think I’m sharing. These are going in my shed”. And, although Dad received a great selection of birthday gifts, my true 70th birthday wish for him, is to “keep going”… so he can also be the Best Pa. This entry was posted in Blog and tagged Australia, birthdays, family, humour, my life, my stories. And what a special, thoughtful gift your Nanna saved for you. It speaks volumes about her. Thank you for sharing a bit of your private life with us. I have just read that first post and am still laughing at the thought of gassing the rat. Was there ever any intention of using that car ever again? Because it sounds like the next person to slide into the drivers seat may well not survive the trip to the first intersection! Just lovely, darling. I reckon I’d like Ron. Many happy returns to him!! Thank you. He has his great Dad moments! The family’s done a nice trade in tactless Sagi’s. Dad with his Sagi moon. Dad’s mother was a Sagi, as is my eldest half sister and our cousin, plus my Aunt’s husband. My other sister could well have a Sagi something with her Gemini sun… when we’re all together, it’s loud. I noticed Dad wasn’t wearing his hearing aid last weekend – not an accident I think. How lovely! 70 is quite a mile-stone. My Dad heads there next month and he is already struggling to keep the fact out of any conversation-and like your Dad, I think it has come as quite a surprise! Something to be proud of! Congrats to your Dad! Longevity is so odd is it not? My grandparents generation outlasted my parents. Although my parents were late 70s, many of the previous lot were in their 80s. Says a lot about cultural changes I guess. 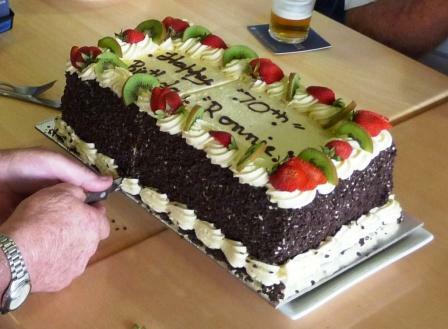 Anyways, congrats to Ron and good that everyone enjoyed celebrating his milestone. Let’s hope there’s a few more to come for him. Longevity is odd but then so is life, and so are families. Mum’s Mum lived until 82 and Dad’s Mum’s Mum was 84 but that is largely overlooked by my lot. There were also some [great] uncles that lived into their seventies, and one is still living but there’s always been a bit of an unspoken fear that they/we would only attain the age of the parent who have passed…. made no sense at all but they clung to it… we’ve all surpassed those benchmarks so now we can get on with celebrating. Happy Birthday to your dad EllaDee, it is a wonderful milestone.